Studies show that building occupants will avoid repeat visits to facilities that have poorly maintained restrooms. Maintaining these areas means cleaning and disinfecting, but it also means ridding the area of foul odors — a difficult task in older facilities that have poor restroom ventilation. Custodial departments find it difficult to maintain expected levels of clean when a building's structure and restroom ventilation is to blame for poor perception. "The Country Club of Virginia is a 105-year-old building in the main portion of our campus," says Pete Waldron, support service manager at The Country Club of Virginia in Richmond, Va. "One of the biggest issues we have is cleaning restrooms that have very poor ventilation." 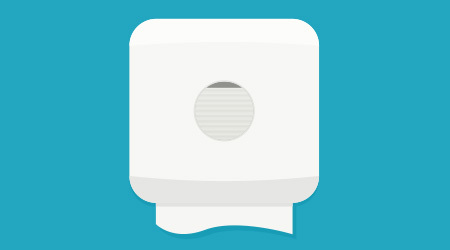 With little air movement in and out of the restroom ventilation system, odors often linger. This includes potential volatile organic compounds (VOC) originating from cleaning chemicals used during cleaning. With a membership of 7,500, the chance of someone having an allergy to a cleaning product is high, so Waldron doesn't use any fragrances in the restroom. Instead, the department tries to use cleaning products with a neutral odor and low VOCs. This is especially important as cleaners tend to restrooms during times when guests are present. "During the day, the restrooms are in constant use," says Waldron. "So we try to catch them as we can." Otherwise, most of the heavy, deep cleaning is done at night and in the early mornings to ensure that there is no lingering scent in the restrooms when members arrive. Cleaning in the evenings allows for the restroom ventilation system to catch up and rid the area of any odor, albeit very minimal. To ensure that odors were being controlled and products and equipment were being properly and consistently used, executives developed an effective and ongoing training program for the staff. Waldron worked with his distributor to provide quarterly training with the staff and monthly follow-up. "Initially, we realized that everyone had their own way of cleaning, and none of them had anything to do with the manufacturers' recommendations for product use," he says. As a result, Waldron switched to a metered dispensing system to promote a more consistent use of cleaning products. That was then reinforced with regular inspections to ensure custodians are using the right products and following the correct cleaning procedures. "We check the restrooms daily, and then check specific areas three times a week," says Waldron. For example, soap scum buildup in the locker room showers has been an area of concern. By checking the shower walls every two to three days to make sure they're clean, Waldron is confident that his staff is using the right cleaning products — and using them properly. The follow-up has also revealed no chemical smell. The restroom ventilation is no longer an issue with this program in place. Identifying restroom cleaning needs and properly executing them can speak volumes about a business, especially in facilities where restroom ventilation is an issue. Managers are advised to review the restroom cleaning program and ensure that the right resources are allocated to the right tasks. Doing so will save time and money, while providing building occupants with a positive experience. To learn about cleaning in schools and around children, click here. To read about restroom cleaning in high-traffic facilities, click here.